Try S'mores on a Stick as an alternative to the campfire classic. You may not like to camp, but you'll definitely like our S'mores on a Stick! Melt chocolate in small microwaveable bowl as directed on package. Dip top halves of marshmallows into melted chocolate; coat with graham crumbs. Insert lollipop stick into coated side of each marshmallow; place on waxed paper-lined tray. Refrigerate until ready to serve. Toast tops before serving, if desired. 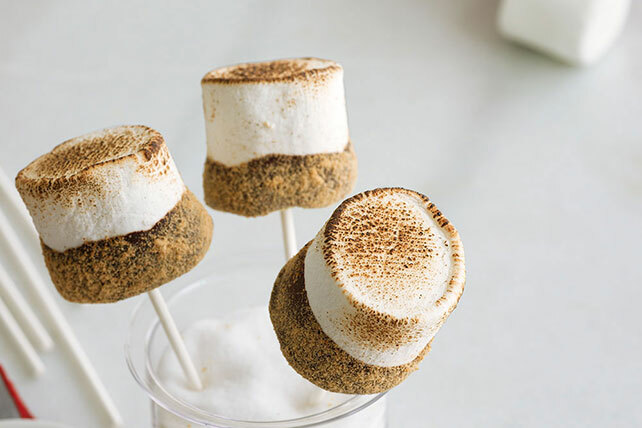 For smaller S'mores on a Stick, dip 16 regular JET-PUFFED Marshmallows into 2 oz. melted BAKER'S Semi-Sweet Chocolate; roll in 2 crushed graham crackers. Continue as directed.